Tickets can be purchased for $25 each in advance, or for $30 the week of the event, as supplies last. Don't delay -- these events sell out! A ticket gets you 10 tokens for one-ounce pours. Additional tasting tokens will be available for purchase at the event. Wristbands, glasses, tasting maps and tokens will be distributed at tables in front of Coldwell Banker Bain starting at 4:45pm the day of the event. Participants must be 21+, ID required. Purchase bottles of wines from the featured wineries directly at the Sip Stops, or at the Pop-up Wine Shop at Coldwell Banker Bain the evening of the event. Proceeds benefit Art Walk Edmonds, a non-profit organization dedicated to promoting the Arts in Edmonds. 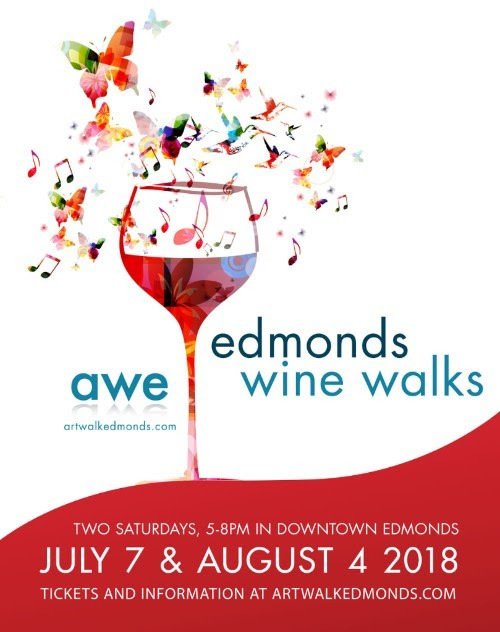 Click here for more info and tickets to the Edmonds Wine Walks!